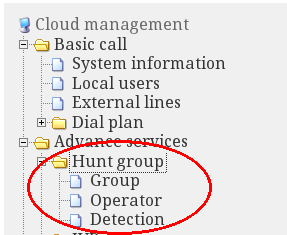 Yesterday we upgraded Cloud-miniSipServer to support hunt-group feature. HG feature has been supported in local minisipserver for a long time. Lots of small companies use this feature to service their customers. The HG service in cloud-minisipserver is almost same with local-minisipserver, such as same service log, same configurations. The difference is GUI display. Please refer to following figures.